There is a yearning for the younger generation to step up and take the mantle of leadership across the various fields of endeavour in Africa. With an average age of 78.5 years, Africa remains the continent with the oldest set of national leaders. This is a big factor behind the under-development of the second largest continent on earth. The campaign for newbreed industry and political leaders is getting louder especially as the largest country in the continent, Nigeria, prepares for its general election. The election is scheduled to take place in less than 15 months from the time of writing. Pushing out the old brigade in the politics seems insurmountable is a lack of youths in leadership posts in Africa. These young people are starved of necessary capacity to compete effectively. Migration in search of greener pastures has also had its toll on the youth of Africa and is chipping away at the continent’s supply of next generation of leaders. The emergence of Blockchain technology, coupled with its decentralized and non-regulated approach presents a breakout opportunity for a generation that is yearning to be heard. Across the African continent, almost all Blockchain startups and related technologies are pioneered by youths between 20 and 45 years of age. The revolution that awaits appears to lie on the bedrock of Blockchain technology. Young Africans in huge numbers are charting new courses without relying on the controlled systems of previous generations. Sensitization, awareness and education are tools that have been embraced by groups around the continent to initiate the emancipation process. Just recently, a group of young Nigerians known as Dash Squard organised a music and cultural festival. The two-day event which registered about 800 attendees involved performances by local artists, but increasing awareness about the digital currency Dash was the crux of the matter. Participants had Dash wallets set up on their mobile devices and were taught how to transact, with tickets and prizes denominated in Dash. The Cryptography Development Initiative of Nigeria (CDIN), led by Adeolu Fadele, is another group that is comprised mainly of young Africans focused on Blockchain as a tool for development across Africa. Having held its first ever conference in November 2017, the group is involved in various educational and awareness programs. It is also setup to collaborate with government agencies and professional institutions towards realizing Blockchain implementation. 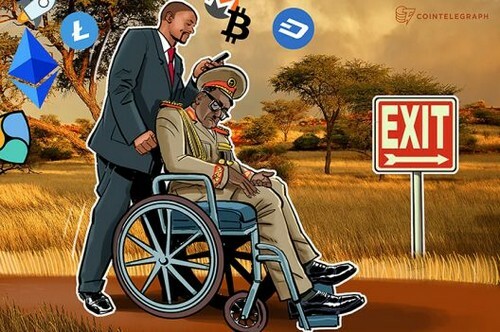 Other groups young Africans to find their voice include eBitcoinics, led by Nawaf Abdullah, and Blockchain Nigeria User Group, founded by Chimezie Chuta. The fact that it is taking so long for the younger generation to find relevance may not call for so much celebration. However the hope that it brings signifies a future of possibilities powered by technological advancement. The good thing about this development is that it remains an exclusive reserve of the next generation who can no longer be bullied out of the system by their current set of leaders. Apparently, there is indeed a future for the African continent which can no longer be taken away from those to whom it belongs.